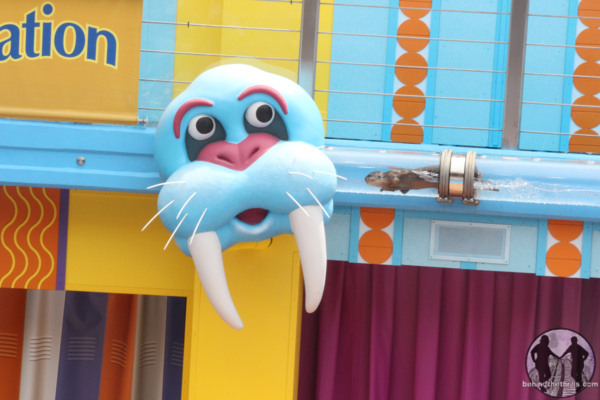 On Thursday, SeaWorld Orlando debuted their highly anticipated new show, Clyde and Seamore’s Sea Lion High. The all new show replaced the long running “Take Pirate Island”, which ran for 16 years, and included tons of bad jokes, pirates and mimes. It was one amazing show. 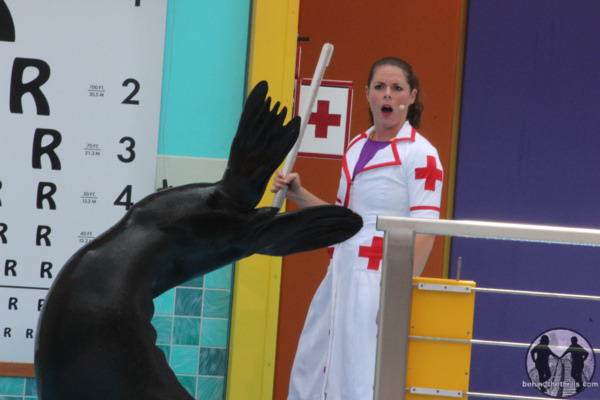 Sea Lion High marks not only a new show for SeaWorld’s comedy bad boys, but also a new direction for the show. 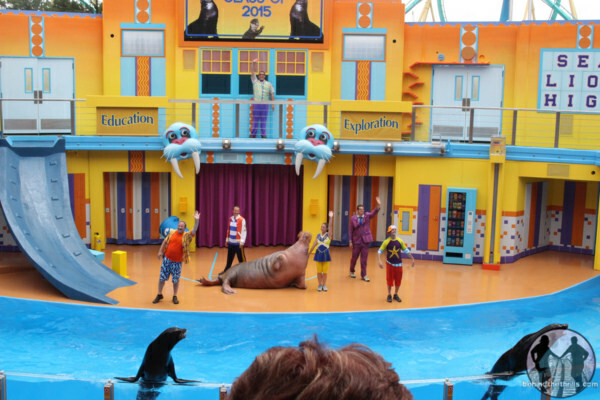 The new show also includes a dazzling new set, new surprises and brand new behaviors by the sea lions. Sea Lion High marks the long awaited return of the huge Sea Lion and Otter show. Where “Take Pirate Island” took place on a pirate ship, Sea Lion High takes place in a high school. That’s because while “Pirate Island” was more a comedy, Sea Lion High aims to educate a little more than it’s predecessor. 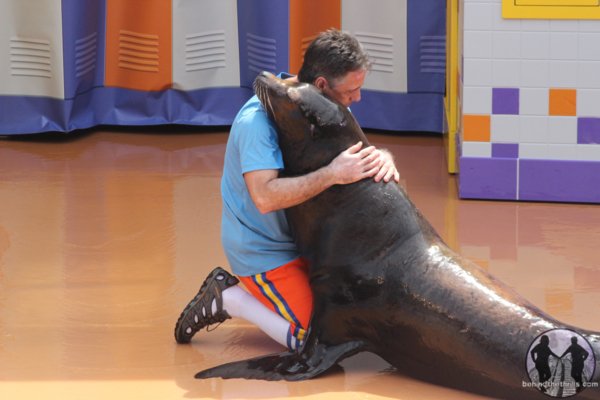 The show starts with a little bit of an educational note, and shows the audience how the trainers work with animals, and get them to do certain behaviors. In some cases the animals don’t always do what the trainer want them, but usually they do. The show also is a lot more high energy. It starts off with not only some high energy music from many high school days, but also an all new “Fight Song” in which the music teacher gets the crowd involved. For those missing the old mimes, the park hasn’t forgotten the fans. While the mimes are not included in this version of the show, there is a bit of entertainment with an all new figure. Video be safe with the crossing guard! 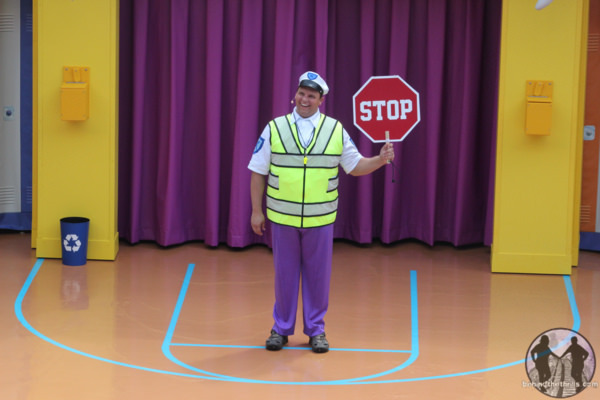 The crossing guard is no mime, but he does his best while trying to get guests safely to their seats. Part of the appeal of the last show, which lasted 16 years, was the inclusion of the Pirate Mimes in the preshow. The mimes would mimic, and have fun with audience members while they tried to find a seat. The Crossing Guard is more helpful than funny, blowing his whistle and awkwardly walking around with his paddle. It might take some time for fans of the show to get used to this guy. 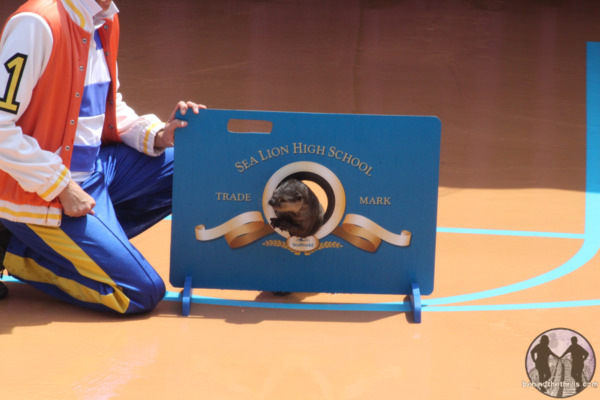 The show itself takes place at Sea Lion High, where it’s graduation day. There are two scholarships up for grabs, and three students are up for them. Tripp, Clyde and Seamore all need those scholarships, and Clyde and Seamore are way ahead of the curve when it comes to getting them. There’s only one problem…Clyde and Seamore somehow have not completed all of their classes! It then becomes a race to finish all the classes in just one day, so that the two can graduate, and get the scholarships. 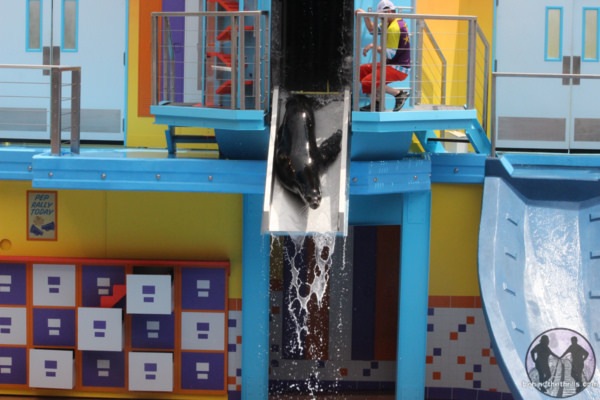 The show itself is full of energy, new props, and new behaviors for the sea lions. 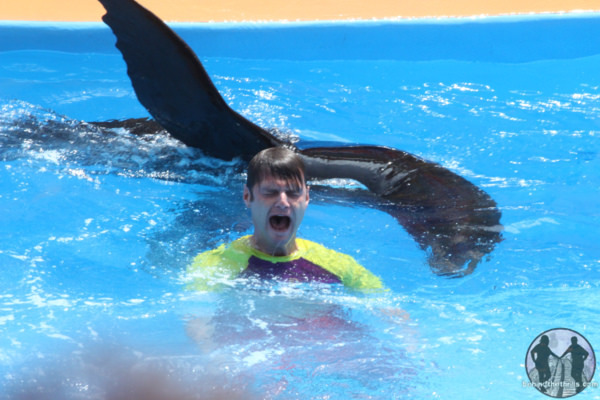 There’s several new scenes in which the sea lions use all new behaviors to hilarious results. 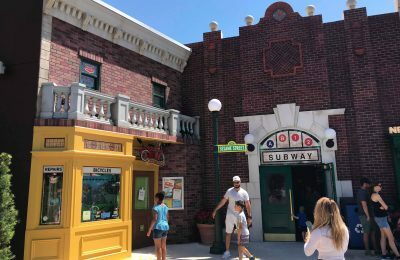 There’s also several chances for the new set to come to life, which it does. There’s also the new actors. 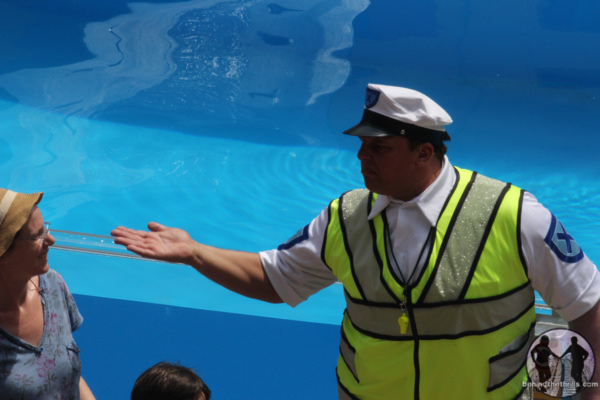 The trainers and crew are definitely more visible in the show, with SeaWorld putting more emphasis on trainer/animal relations. The otters also get a lot more to do than normal, going through tubes, and even recycling soda cans. They play an even more fun part in the show than before. 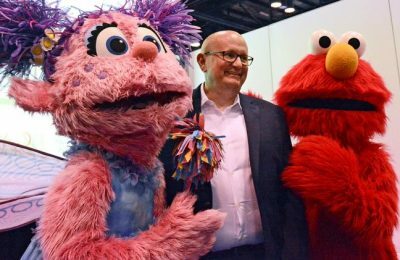 There are several new characters that are all part of the new curriculum, and add to the fun with their own comedy styling. You may recognize a few faces from other shows. For fans of the show, there are also tons of little nods to past shows, such as “Pirate Island”. 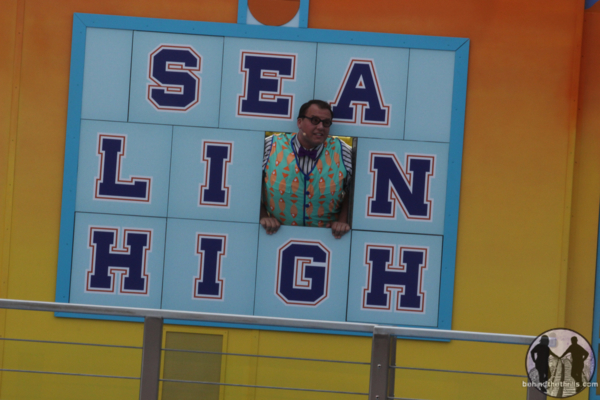 Video: Enroll in Sea Lion High with the FULL SHOW! Overall the show is fun, and takes a lot of different approaches. Is it as funny as Pirate Island? It definitely has some hilarious moments, but it doesn’t feel as spontaneous as that show was. There will definitely be those who will miss the old show, but the new one is definitely a lot of fun as well. 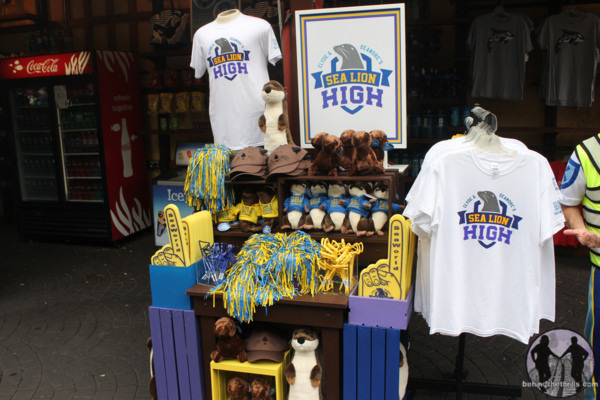 Merchandise appropriately matches the high school pep rally theme, and Opie Otter gets his due with hats and very cute plushes. There’s also foam fingers, and pom poms for all your cheering needs. 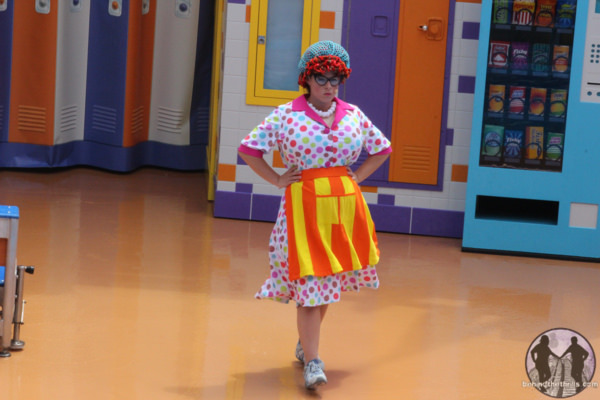 Some of our favorite moments include the lunch lady that is…well, she’s ridiculous, but amazingly funny. Then of course there’s the little movie tributes. JAWS is a hilarious recreation, while Opie Otter does his best “MGM Lion”. For those who want to get wet, you’ll get your wish, as the new show has amped up the splash zones. Guests sitting in the first 12 rows get positively SOAKED! 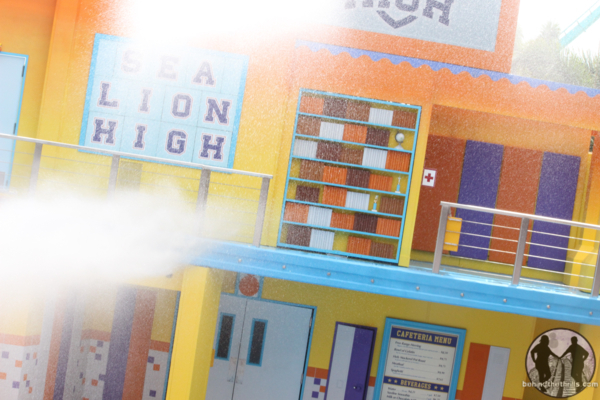 Clyde and Seamore’s Sea Lion High is now open, and is playing several times daily.